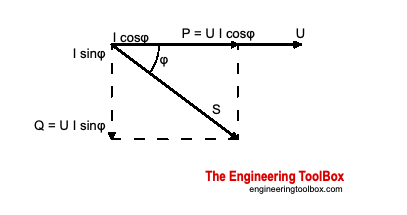 The required power supply is called the apparent power and is a complex value that can be expressed in a Pythagorean triangle relationship as indicated in the figure below. The apparent power is the power supplied to the electric circuit - typical from a power supplier to the grid - to cover the real and reactive power consumption in the loads. Apparent power is measured in volt-amperes (VA) - the AC system voltage multiplied with flowing current. Apparent power is a complex value and the vector sum of the active and reactive power as indicated in the figure above. Active - or real or true - power do the actual work in the load. Active power is measured in watts (W) and is the power consumed by electrical resistance. Reactive power is the imaginary or complex power in a capacitive or inductive load. Reactive power represents an energy exchange between the power source and the reactive loads where no net power is gained or lost. The net average reactive power is zero. Reactive power is stored in and discharged by inductive motors, transformers, solenoids and capacitors. Reactive power should be minimized because it increases the overall current flowing in an electric circuit without providing any work to the load. Increased reactive currents only provides unrecoverable power loss due to power line resistance. Increased reactive and apparent power will devrease the power factor - PF. Reactive inductive power is measured in volt-amperes reactive (VAR). Engineering ToolBox, (2005). AC - Active, Reactive and Apparent Power. [online] Available at: https://www.engineeringtoolbox.com/kva-reactive-d_886.html [Accessed Day Mo. Year].